After the highs of the European U18 championships, attention swiftly shifts to the World U20 Championships which started in Tampere Finland yesterday and features 1,462 athletes from over 150 nations. Among them is Ireland with a team of 19, of which 12 are women. Last year Gina Akpe Moses of St Gerard's Dundalk, won a European U20 title and she begins her campaign in the 100m heats this morning. Semi-finals are tomorrow afternoon, with the final later in the evening. Akpe-Moses may have triumphed at European level last year, but on the current world rankings, you will scroll down to 22nd before finding a non-American or Jamaican name. Topping the table is Twanisha Terry of the USA with a best of 10.99 this season. Her clash with Jamaica's precocious Briana Williams, three years younger than her at 16, is eagerly awaited. Akpe Moses, who trains with Birchfield Harriers in the UK, is ranked 23rd in the world for her time of 11.46 secs from last May. She will also line out in the 200m, with heats and semi-finals of Friday. For that event, Sydney McLaughlin of the USA, the current NCAA 400m hurdles champion, is top ranked with a time of 22.39 secs. Ciara Neville of Emerald AC will also compete in the women's 100m and 200m. Competing in the men's 200m is Aaron Sexton of North Down, who ran a personal best 21.12 secs in Tullamore last month. On paper, Ireland's best chance of a medal could come in the women's high jump, with qualification on Friday. Sommer Lecky of Finn Valley has a lifetime best of 1.85m, and so far this year, has already gone over 1.84m, which is enough to rank her in the world top 10. Leading the entry is the Colombian Maria Fernanda Murillo who has a 1.90m leap to her credit. Also starting on Friday is the women's 100m hurdles, in which Molly Scott of St LOT represents Ireland after improving her personal best to 13.72 secs this season. Competing in Saturday's 10km walk are Niamh O'Connor of Celbridge AC and Orla O'Connor of Waterford AC. A few hours later, in the men's 5000m, 17-year-old Darragh McElhinney of Bantry AC faces formidable opposition from the best of east Africa, with Ethiopia's Selemon Barega, champion from two years ago, leading them all. Last month, Barga won the 5000m at the Stockholm Diamond League meet with a time of 13:04.05. McElhinney ran a personal best 14:11.80 in Oordegem last May. 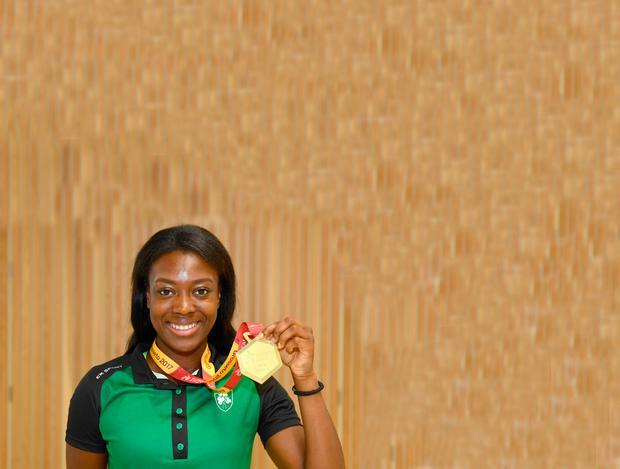 The Irish campaign finishes with the 4x100m relays on Saturday afternoon.The Irish women's team includes Akpe Moses and Scott along with Ciara Neville, Lauren Roy of City of Lisburn, Patience Jumbo Gula of St Gerard's and Tallaght's Rhasidat Adeleke , fresh from her 200m gold at the European U18s. Sexton leads a men's 4 x 100m squad which includes Coror Morey of Leevale A, Galway's Jack Dempsey, David McDonald of Menapians AC Reality Osuoha of Fingallians AC and Israel Olatunde of Dundealgan AC.